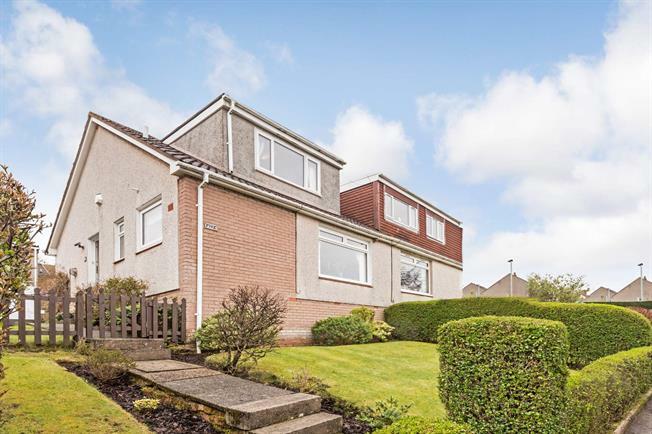 3 Bedroom Semi Detached House For Sale in West Kilbride for Offers Over £115,000. Located within this small cul de sac of similar properties, this semi detached chalet style bungalow offers excellent, family accommodation formed over two levels. Considerably upgraded in recent years by the current owners viewing reveals a most attractive home which will be popular with the discerning buyer. Reception hall, double aspect lounge/dining room with French doors to the rear, modern, well equipped kitchen, family bathroom and bedroom three complete the lower level. The staircase to the upper level comes off a former bedroom which now offers storage beneath the stairs. The upper level leads to the main two bedrooms and useful toilet with two piece suite. Fine views are enjoyed by both of the first floor level bedrooms. The property has gas central heating and double glazing. There are garden areas to front and rear. The area to the rear is laid out with a view to easy maintenance with decking and chipped areas. The garage is accessed from the rear where there is also on street parking.